Primary Natural Resources natural gas, iron ore, sand, coal. IN THE SOUTH PACIFIC OCEAN, the country of New Zealand lies to the southeast of AUSTRALIA. 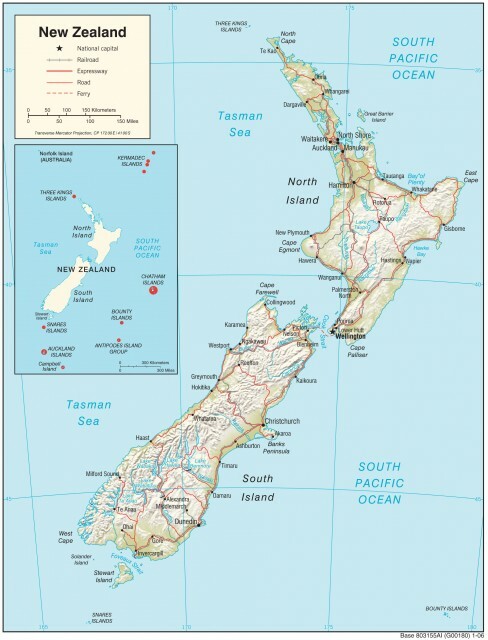 However, while Australia is continental in size and largely desert (or outback) in landscape, the land of New Zealand consists almost entirely of two islands (unimaginatively named North Island and South Island) separated by the 20-mi- (32-km-) wide Cook Strait. Quite small compared to Australia, about the size of COLORADO in area, New Zealand displays a wealth of landscapes, usually rich in scenic beauty. South Island is headed by the Southern Alps, a string of mountain peaks running for about 300 mi (500 km). Much of New Zealand was created from volcanic action. The islands lie along the collision lines of tectonic plates (Pacific and Australian). The resulting geologic activity has caused volcanic eruptions throughout New Zealand’s history. The North Island retains most of the country’s volcanic activity. There, in 1886, Mt. Tarawera’s especially violent eruption was heard hundreds of miles away but locally buried the prosperous neighboring village of Te Wairoa. This general region is now known as Rotorua, where continued geothermal activity creates a wondrous and startling landscape. Similar to the geothermal features found in Yellowstone Park in the UNITED STATES, the elements of Rotorua include geysers, mudpots, hot pools, and more. In contrast, the Southern Alps often feature glaciers, most notably the Tasman Glacier. On both islands the presence of mountains prompts OROGRAPHIC PRECIPITATION, which, coupled with the moist air inherent to the island setting, produces plentiful rainfall throughout nearly all of the country. Many areas are intensely forested, with the western regions of South Island having RAINFORESTs with 80 to 100 in (203 to 254 cm) of rain annually. Only the Canterbury Plain receives less than 30 in (76 cm) of precipitation yearly. 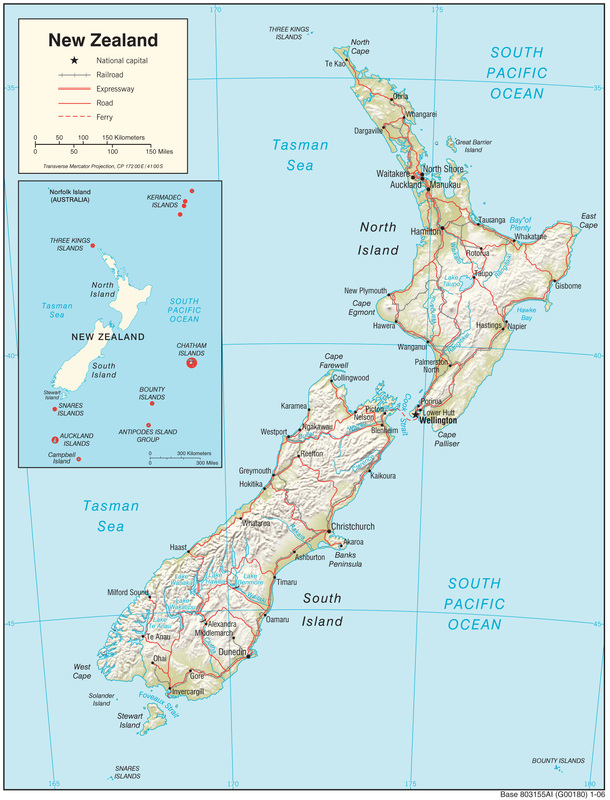 As a group of islands, New Zealand abounds in beaches, with 9,404 mi (15,134 km) of coastline. Because New Zealand climate is mainly an oceanic temperate climate, the far northern reaches are nearly subtropical and New Zealand features very successful commercial agriculture. The kiwi fruit was introduced in about 1900; New Zealand now harvests the fruit in world-leading numbers. Apples and other fruits also are exported, as well as wine produced from New Zealand grapes. Boosted by the advent of refrigerated ships in the 1880s, New Zealand farmers were able to ship dairy products and meat as far as England. Sheep and cattle grazing expanded rapidly, to the current numbers of about 60 million sheep and 8 million cattle, impressive figures for a country whose human population is less than 4 million. Overall, agriculture yields about 30 percent of the country’s export earnings. The industrial and service sectors of the economy have grown rapidly in recent years. An “Australianization” of the economy, via rapid expansion of Australian companies into the New Zealand market, has become a cause of concern for many New Zealanders. Settled originally by Polynesians, the arrival of Europeans, principally British, prompted accelerated growth of the population. Known as the Maori, the Polynesian sailors reached New Zealand from the north about 1,000 years ago. These early settlers preferred the climate and setting of the North Island, where modern day Maori also tend to live. Official European discovery came in 1642 with the voyage of Dutch captain Abel Tasman. Attempting to reach the great southern land (Australia), Tasman sailed too far south (hitting the island now known as Tasmania) and too far east, reaching New Zealand (FIJI and TONGA too). British settlement was spurred by the voyages of Captain James Cook in the 1760s. British sovereignty was established by the 1840 Treaty of Waitangi, though sporadic conflict with the natives culminated in the British-won Maori Wars of the 1860s. A gold rush during the 1870s brought a surge in the population. Self-rule was granted by the British in 1852, dominion status was given in 1907, and formal independence was established in 1947. Maori now account for about 10 percent of New Zealand’s population. As a modern developed society, New Zealand currently experiences slow population growth of 1 percent annually.